Yesterday my girls (wife Lynne and daughters Mollie and Madison) took me and my father to the Missouri Botanical Garden for Fathers Day. Although I’m an entomologist, I also have a strong botanical bent, and although my wife and father are not scientists like me, they nevertheless find a day at the Missouri Botanical Garden as enjoyable as I do. The girls, on the other hand, will never admit that they like it the way the rest of us do, but I think deep inside they enjoy it very much and, in later years, will look upon these visits as some of their fondest Mothers and Fathers Day memories. 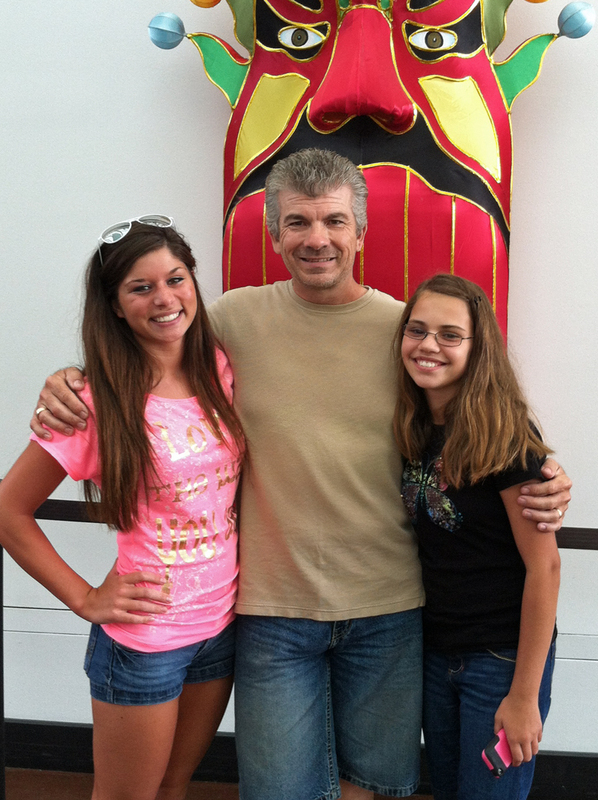 Me and daughters Mollie and Madison. 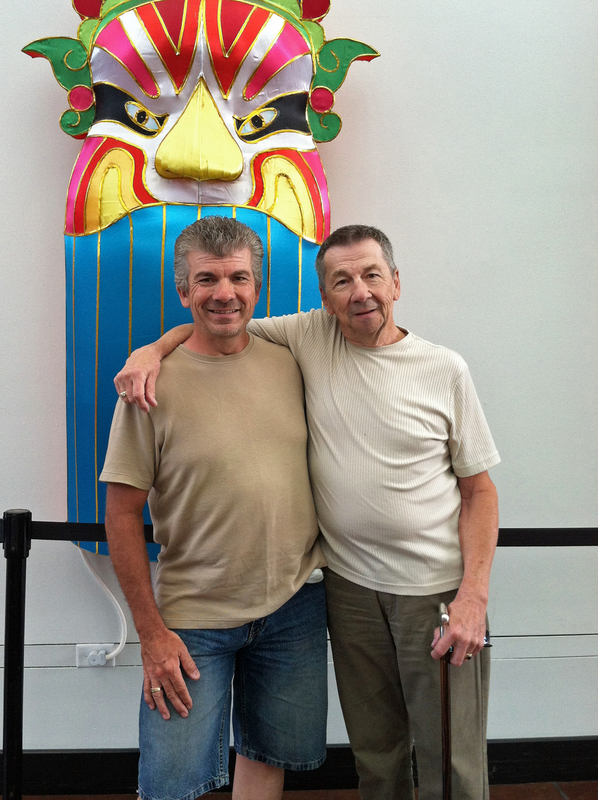 My father and I have been back together for 20 years now. With my wife and daughters, he has become one of the most important persons in my life. I wrote an essay about my father four years ago that explains how he made me whole—it still rings true today. 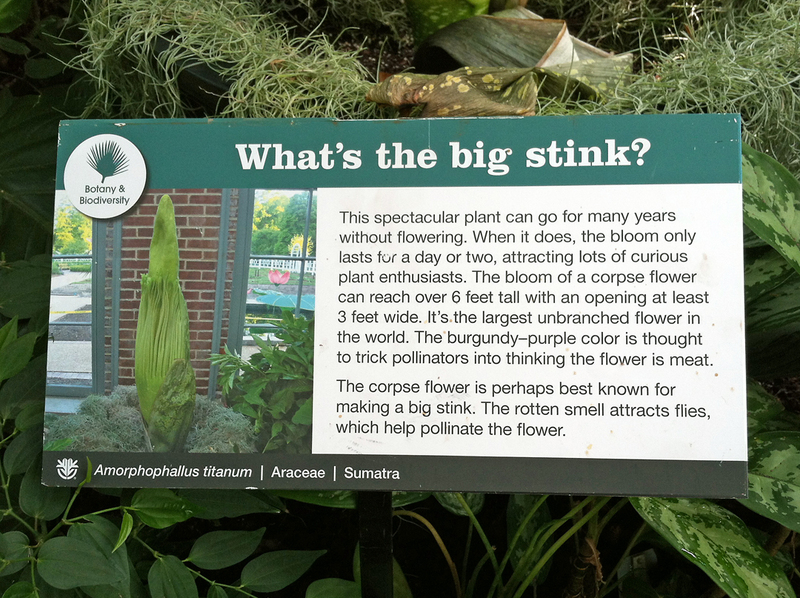 I have been to the Missouri Botanical Garden many, many times over the years, but one sight have have still never seen is a corpse flower (Amorphophallus titanum). I learned earlier this week that one of their plants is about ready to bloom, so I eagerly looked for this plant as we wound our way through the Climatron. As we came near the end and I still hadn’t seen it, I wondered if somehow I had missed it along the path. Suddenly I caught a glimpse of the giant 3′ tall flower bud near the end of the footpath, and I knew instantly that I had found what I was looking for. 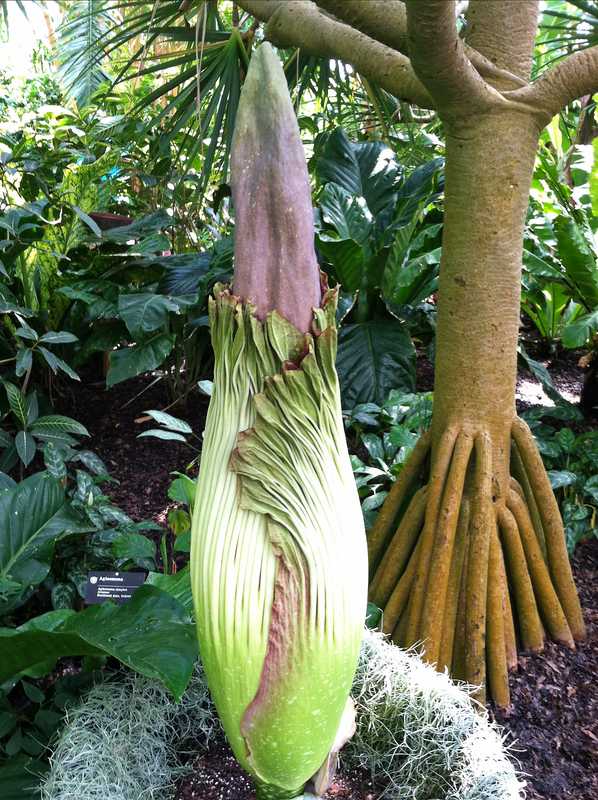 Corpse flower (Amorphophallus titanum) getting ready to bloom. I will be keeping track of the progress of this flower over the next couple of weeks on the Missouri Botanical Garden Facebook page in hopes that I can see it again when the flower opens fully—a rare botanical treat that few people ever get the chance to experience! In my younger years when I had a bit more free time on my hands I was a hobbyist orchid grower. I didn’t have a greenhouse but nevertheless managed to keep a steady supply of plants in bloom by growing them outdoors under shade cloth with heavy watering and fertilizing during the summer and moving them indoors under fluorescent lights and in bright windows during the winter. I don’t have nearly the time for such pursuits these days, but I still enjoy looking at their exquisite and infinitely diverse blooms whenever I have the chance, and the Climatron never fails to disappoint. One of many epiphytic orchids blooming in the Climatron. While walking through the Climatron, I noticed a very exotic looking lizard on the trunk of one of the trees. I watched it licking exudate from the trunk and thought such behavior seemed rather odd. I later learned that this was the Standing’s day gecko (Phelsuma standingi), and that it might have an important role in pollinating the double coconut palm (Loidiocea maldivica). Both are endemic to the Seychelles Islands north of Madagascar, with the latter bearing the largest seed of any plant in the world (up to 45 lbs. in weight). The photo below was taken of another individual through the glass of its terrarium and, thus, lacks some clarity, but it shows the vivid colors and markings that distinguish these diurnal geckos from the other more typically nocturnal members of the gecko infraorder. 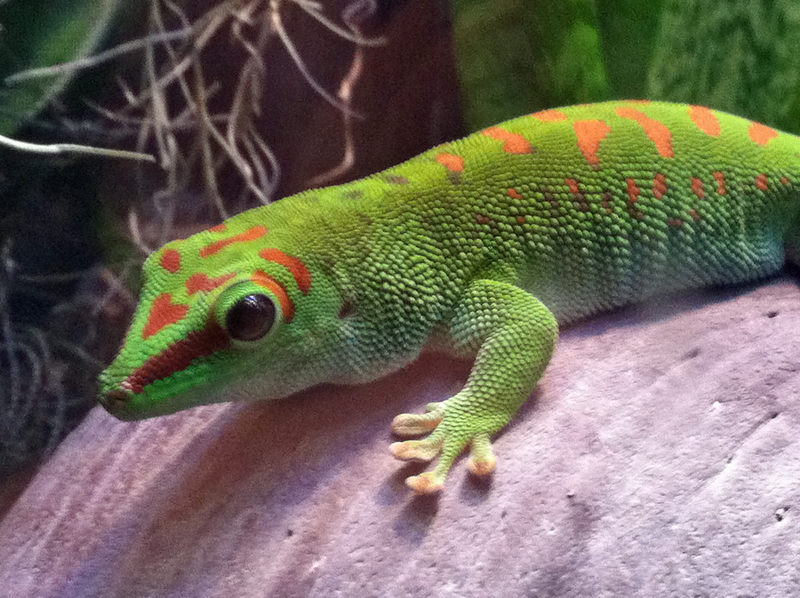 Standing’s day gecko (Phelsuma standingi). While not gracing this post in a photo, many thanks to my loving wife, Lynne, who is the best mother my daughters could ask for and who helped make yesterday the special day for me and my father that it was! 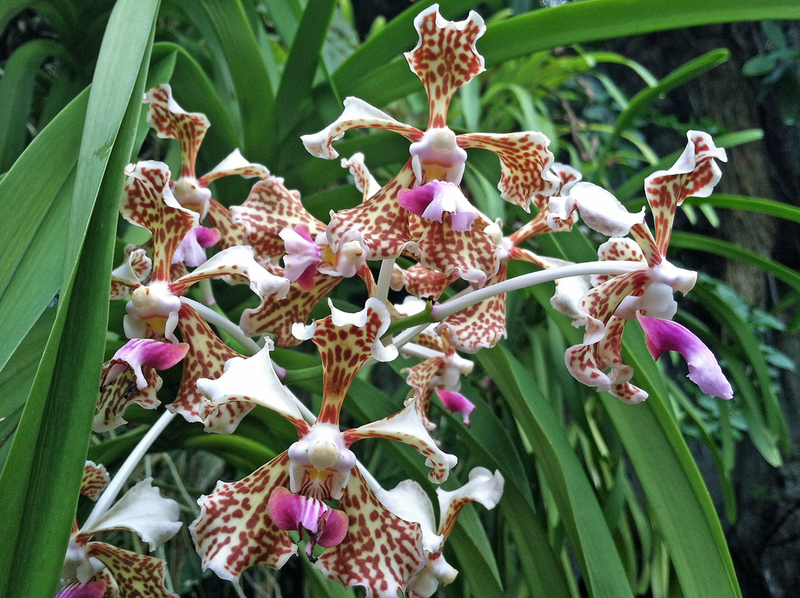 This entry was posted in Orchidaceae, Reptilia, Vertebrata and tagged Botany, family, holiday, introspection, lizards, Missouri Botanical Garden, orchids. Bookmark the permalink. Wonderful post. Insects and flowers are wonderful, but families are superb! I hope your daughters will always remember this day with Dad and Grandpa and Mom!